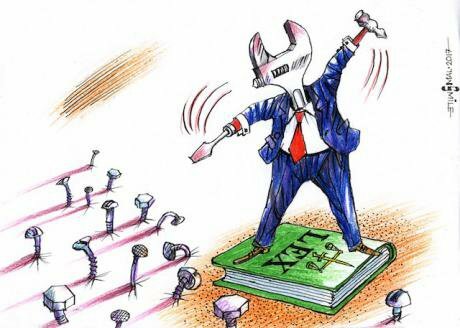 The Lex cartoon is created by Oleh Smal for the Netherlands Helsinki Committee. All rights reserved. Public prosecutors in many countries are deeply involved in human rights abuse, in violation of their professional standards. Patterns of abusive practices by prosecutors are a stain on the profession. The global body of prosecutors, the International Association of Prosecutors, will be holding their Annual Conference in Beijing from 10 to 15 September. Their hosts are the Chinese prosecution service, who have taken on human rights lawyers particularly harshly and arbitrarily over recent years. The trend towards the limiting of space for civil society and the defense of human rights has since then only become more intense. Think of developments in Russia and neighbouring countries such as Azerbaijan, think of Turkey, think of Egypt and the Gulf countries, think of China. Azerbaijan, whose authorities closely cooperate with the IAP, is in the midst of a major crackdown on civil rights defenders, bloggers and journalists, imposing hefty sentences on fabricated and trumped-up charges in trials that make a mockery of justice. Torture is an issue here as well; earlier this year a well-known blogger was sentenced to two years imprisonment for complaining about torture, without his complaint being taken up in a meaningful way. The IAP sees itself as an “international Community of Prosecutors committed to setting and raising standards of professional conduct and ethics for Prosecutors worldwide; promoting the rule of law, fairness, impartiality and respect for human rights and improving international co-operation to combat crime.” International cooperation clearly is served by the IAP but professional and ethical conduct seems to need massively more attention. Despite a Constitution and a Professional Standards document that explicitly refer to human rights, no procedure is in place to monitor compliance of members and follow up on problems identified. Over the last years, the IAP has been approached several times by NGOs with complaints about persons in leadership or senior positions; in 2013 about Ali bin Fadhel Al Buainain, the Attourney General of Bahrain and member of the IAP’s Executive Committee, and in 2015 about Yuri Chaika, the Russian Prosecutor General and member of the Senate (the body of past members of the Executive Committee). The 2013 complaint, submitted by Ceartas, Irish Lawyers for Human Rights, raised the reported involvement of Al-Buainain in unfair trials of protesters and in failing to follow up on indications of torture. The complaint about Chaika came from Navalny’s Anti-Corruption Foundation and submitted information about corruption schemes in which his sons are involved that are not tackled by the prosecution service. Both complaints were turned down without providing a substantive explanation to the complainants. A proper individual complaints mechanism should not be the only, and may be not the most important, procedure the IAP should put in place. A 2016 petition signed by over 50 human rights NGOs working globally or in the Europe/ Eurasia region had a more generic request, that the IAP “urgently develop procedures to address the gap between professional ethics and practice”. The IAP has individual as well as organizational and institutional membership and compliance with the IAP’s own professional standards is called for again by over 120 international and national human rights and anti-corruption groups from across the world. The IAP does take visible steps with regard to the situation of members of the profession in particular countries – not surprisingly, these are situations in which their colleagues are under threat, from an overbearing or one-sided executive, from organized crime or from violent political groups. Clearly, these are issues of crucial importance to the profession. In particular prosecutors who dedicate themselves to fighting rights abuses and who stand for the integrity of the profession may fall victim to these threats. Yet, it is all too common that prosecutors are an instrument of oppression and become complicit in human rights abuse. The IAP has spoken out about the recent persecution without proper procedure of prosecutors in Turkey, but other prosecutors are implementing this policy, and at the same time are engaged in arbitrary steps against human rights defenders, journalists and lawyers. Prosecutors should be human rights defenders and in many instances they are. But systematically neglecting human rights abuse in the name of international cooperation and trustful collegial relationships will only undermine rather than strengthen the credibility of the profession.